We have designed this FAQ page to answer all of your questions relating to how to care for your wig or hairpiece, how to wear your wig and how to send us a sample of hair to match your color. For questions relating to ordering, shipping, returns, exchanges or other related matters, please see our Customer Service page. How do I send a sample of hair? How often do I clean my wig or hairpiece? How do I clean my synthetic wig or synthetic hairpiece? Can I use hairspray on my wig or hairpiece? Are their any other styling products available for synthetic or human hair synthetic blend wigs and hairpieces? What type of styling tools can I use on my wigs and hairpieces? How do I clean my human hair wigs and hairpieces? How do I put on and wear my wig? How do I store my wig? What about cutting, re-setting and coloring my wig or hairpiece? Can the wig be made bigger or smaller to better fit my head? How do I take my correct head measurements? How does your professional styling service work and what is the cost? What does a Monofilament Wig Mean? Can I buy or borrow a color ring to find the color that's right for me? Why do some Look of Love human hair colors cost more than others? 1. How do I send a sample of hair? Cut a piece of the hair to be matched at least .5 inch wide and 1 to 2 inches long. Enough hair must be in the sample to be able to determine its actual color. To match a hairpiece or hair extension to your own color: Cut the hair sample in the area where your own hair blends naturally into the point where the hairpiece or hair extension begins. To match a wig to your own hair color: Cut the piece of hair from an area that best represents your overall hair color. This area is usually in the upper layers or outer ends of your hair. You would NOT find your best overall color match, for example, at the hairline on your neck (nape). This area is usually darker in color than your overall hair color. Please tape the hair sample to a letter size sheet of paper. This paper must also include your name, address, phone number and e-mail address. Also, please let us know which wig or hairpiece you are considering. 2. How often do I clean my wig or hairpiece? If worn daily for 10 to 12 hour a day, we would suggest you wash it once every 10 to 14 days. But, there are factors that could change this, depending on the individual wearer, the type of styling products used or the environment in which the wig or hairpiece is worn. You, personally, will be the judge of when it needs to be cleaned. 3. How do I clean my synthetic wig or synthetic hairpiece? 2 quarts of COOL WATER. NEVER USE HOT WATER! (hot water will remove the pre-styled curl pattern that is built into a synthetic wig or synthetic hairpiece). Add approximately 2 ounces of Synthetic Hair Cleanser to the cool water and swish around to mix. Then you are ready to place the hairpiece or wig into the solution. Allow to soak for 5 to 10 minutes, and then swish the piece around in the soapy solution for a minute. Note: If your wig has makeup build-up along the front hairline, we recommended you use an old toothbrush and hand soap to remove this. After washing, discard the soapy water. Rinse sink and fill up with clean cool water; sometimes you may want to rinse twice. Shake out excess water. After washing, simply lay the hairpiece on a towel to air-dry naturally. DO NOT BRUSH WIG WHILE WET. DO NOT USE A HAIRDRYER ON WIG. This kind of heat can damage fiber hair! 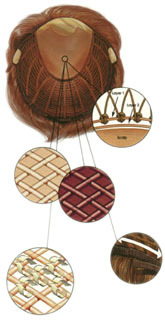 If you have a wig, it is recommended that you place it on a wire head form so it dries in its natural round head shape. (Air can pass through a wire form. Air cannot pass through a Styrofoam head form.) Both the Wire Stand and the Deodorizing Wig Perch are excellent for this purpose. We recommended a special Synthetic Fiber Hair Conditioner: It conveniently sprays onto your wig or hairpiece. This conditioner should be used lightly after each washing as well (for longer hairpieces, use each time your hairpiece is worn). Conditioner build up is good and provides a longer life for synthetic hair, eliminates static electricity (which can also damage fiber) and makes fibers look healthy. 4. Can I use hairspray on my wig or hairpiece? For those who like using a holding spray, we provide Synthetic Fiber Hairspray. It not only holds hair in place beautifully, but washes out completely and is water soluble. Holding sprays that are not water soluble should never be used! human hair synthetic blend wigs and hairpieces? Synthetic Hair Glosser spray is a product that helps maintain a natural healthy sheen to synthetic hair fiber. As a hairpiece or wig gets used and is washed a number of times, it may start to lose its original sheen. ShineIt helps restore that sheen! Synthetic Hair Liquid Mouse Volumizer adds ultra protection, texture and body, for fuller feeling wigs and hairpieces. This is a great styling product for all synthetic fiber styles. 6. What type of styling tools can I use on my wigs and hairpieces? Depending on the type of hairpiece or wig you own, it is advisable to lightly pick or brush the ends to soften the appearance each time you wear it. On long pieces, always start from the ends. Brushes that have single teeth from the base and have bristles that can flex or bend as they pass through the hair; this will lessen any possible damage. through the fiber with minimum resistance or pulling. Combs with bigger spaces rather than close-together teeth. 7. How do I clean my human hair wigs and hairpieces? made for human hair wigs & human hair hairpieces. First, fill a small hand sink or a large-sized bowl with COOL WATER. Add approximately 2 ounces of ShampooIt to the cool water and swish around to mix. Then you are ready to place the human hair hairpiece or wig into the solution. Allow to soak for 3-5 minutes, and then swish the piece around in the soapy solution for 1 minute. Note: If your wig has makeup build-up along the front hairline, we recommend you use an old toothbrush and hand soap to remove this. Remove excess water by blotting with towel. Spray on Restorelt liberally throughout hairpiece or wig, do not over saturate. You can set it under a hot dryer until dry, or let it naturally air dry overnight. 8. How do I put on and wear my wig? Remove the protective hair net from your wig. Give the wig a good shake to allow air to fluff through the hair fibers. If your hair is short, brush it back from your face and behind your ears. If your hair is long, distribute and pin your hair up evenly, so as not to have a "bump" anywhere. Many people use a wig cap, and it’s very convenient. Hold your wig at the sides with the woven label in the back. Place it at the middle of your forehead (for leverage) and slide it on from front to back. The top front of the wig’s cap should rest approximately 1/4" past your natural hairline. If the wig is too forward at the front hairline, it will look hat-like and unnatural. The ear tabs on each side of your head should be evenly placed in front of your ears. Never place the wig over your ears. Tuck in any stray hairs at the front, sides and nape. 9. How do I store my wig? The best way to store your wig is on a Wire Wig Stand or Wig Perch Wig Stand. This will keep your wig fresher and maintain its style between wearings. Keep your wig in a clean place, away from dust, sources of high heat and excessive humidity. Never enclose in a box or plastic bag (except while traveling). 10. What about cutting, re-setting and coloring my wig or hairpiece? We recommended that any cutting, coloring or rinsing, as well as permanently re-curling of your wig or hairpiece, should be done by us or another trained professional. 11. Can the wig be made bigger or smaller to better fit my head? Yes, all wigs can be adjusted to fit your needs, by tightening or loosening the Velcro tabs located in the back of the wig. If your wig is still too large, you may want to consider purchasing a Comfy Grip. The Comfy Grip has been found to be beneficial for every wig wearer due to its ability to hold the wig securely and comfortably in place. We feel it is necessity for people who have experienced total hair loss. 12. How do I take my correct head measurements? Most people wear "average". However, if you aren't sure of your size, click here for instructions on how to measure your head. 13. How does your Professional Styling Service work and what is the cost? If you feel you need alterations for example, making your wig cap a smaller size or stretching the wig cap for an extra large fit, please e-mail us your measurements at customerservice@fekewigs.com and we will give you a price for this additional service. 14. Will my wig frizz? Frizzing is usually caused by excessive steam; for example, opening the oven, the dishwasher, the clothes dryer and any other heat source, such as the blow dryer and curling iron. Frizzing also occurs by friction, such as long hair wigs rubbing against the back of the chair. 15. What are the hours of operation? Our hours of operation are Monday thru Friday from 9:00 am to 5:00 pm (Eastern Standard Time). If by chance you receive the voice mail service during our regular business hours, please leave a message and one of our customer service representatives will call you back. 16. What does a Monofilament Wig mean? A wig cap style, offering the most realistic scalp appearance and hair movement possible! The hand-tied top, combined with a double monofilament, creates extra comfort as well as quality and naturalness. 17. Can I buy or borrow a color ring to find the hair color that's right for me? Yes, we offer the Color Ring Loaner/Purchase Program, which allows you to purchase a color ring or borrow one for up to 30 days. Please visit our Wig Colors page for more details. 18. Why do some Look of Love human hair colors cost more than others? Darker shades of our human hair colors are more closely related to the original color of our hair from India and China. Our factories can process this hair to make various darker hair colors without too much difficulty. However, our factories have now increased our costs for processing lighter hair colors offered by our company. This is due to the extra time, products and educated craftsmanship required to achieve quality hair colors with the least amount of abuse to the hair structure/cuticle. Therefore, you will notice a slightly higher selling price if you should choose one of the lighter hair colors. Thank you for your understanding.